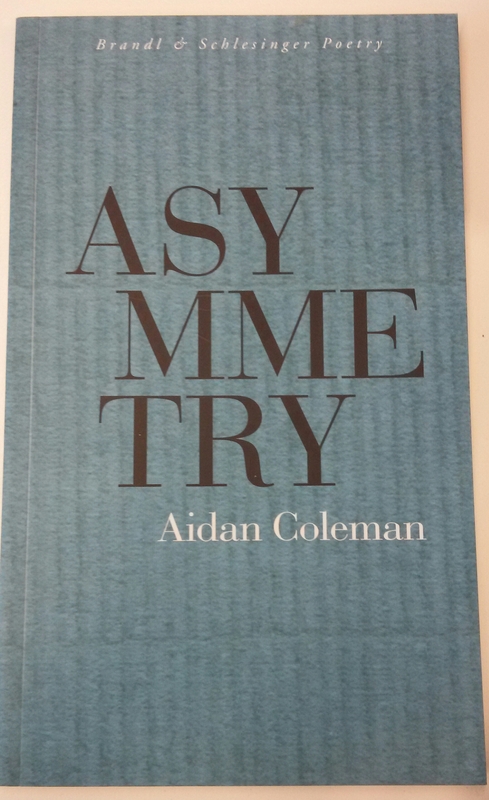 This year’s line-up at Adelaide Writers’ Week were all from South Australia – Aidan Coleman, Jelena Dinic, Jill Jones, Kate Llewellyn and Thom Sullivan – who shared poems from their own collections as well as from a poet who has influenced them. Peter Goldsworthy compered the event, telling us about the new state-by-state anthologies from Australian Book Review (ABR), in which these poets feature, before moving on to introduce each of them. Next up was Jelena whose work I just adore, influenced by Vasko Popa, a Serbian poet. 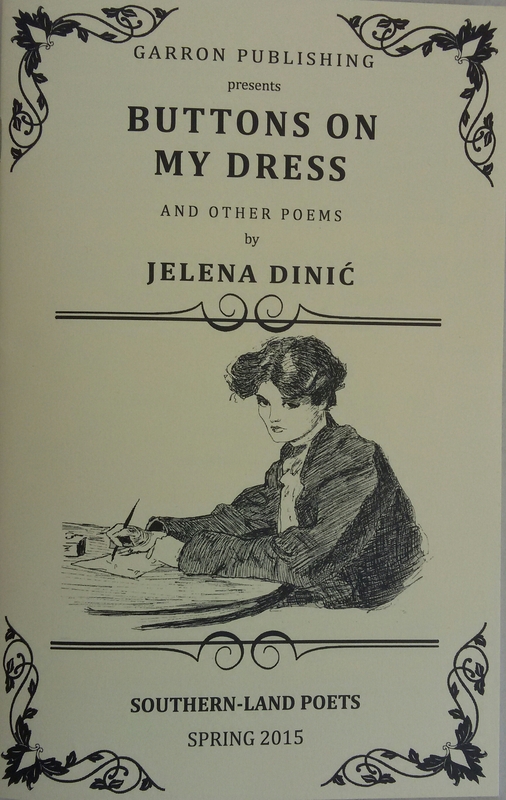 Jelena started with ‘Dawn chorus’, a sinister poem about her ancestors from her chapbook, Buttons on my Dress also by Garron Publishing, where ‘under their tall hats time waits’ followed by ‘Visiting’, describing a time Jelena returned to her hometown culminating in the fantastic lines ‘Lamp-lit photographs are mute. I pretend to know the answer’. Next up was ‘Wedding’ where she asks the obligatory question ‘stepping on his foot just in case’ and then one of my favourites ‘Portrait of Olympia the Prostitute’ which is just that, ‘her black-cat eyes mastering the craft of the second hand love.’ ‘Ballad retold’ was a longer piece from the chapbook, as well as its final one, in which she walks ‘fine lines where beauty hurts’. Jelena finished with a poem by Popa called ‘Before the game’, which she read in English and then Serbian, in particular for her parents in the audience. Jill’s work is exquisite, her poems have been described as ‘tapestries of the present’, and she didn’t fail to impress. She began however, with her influence Peter Gizzi an American poet producing layered poems both intimate and global. Jill then read ‘Bent’, her poem in ABR’s state anthology, where ‘I make sense then drop it, it gets dirty, it breaks, the ants carry it’, a very poignant piece and with the poems that followed, Jill went on to paint equally vivid images – ‘maps of rain and passage of stars’ and ‘the sky is as opaque as reality’. 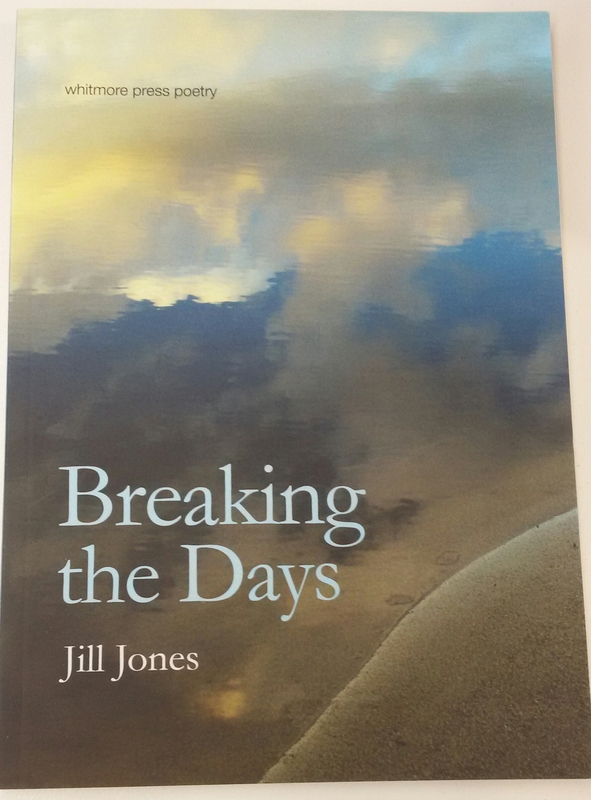 Jill shared a few poems from her new collection Breaking the Days published by Whitmore Press Poetry, starting with ‘Happy families where ‘your own genius spooks, it runs to the cupboard and breaks all the plates’, followed by a sense of separation in ‘Fractions’ where ‘you could be tempted to fold’ and in ‘Not all choices’, she is out ‘to relieve the dog of its chasing thought and the business in the head’. Now I must admit Kate is new to me, I’ve not heard her read before, but she was introduced as SA’s most popular writer, known to her friends for her legendary letters. Kate started with ‘Harbour’ about both sailing into Sydney and growing old, where ‘the little casual things I see grow into a roar.’ Kate’s next poem ‘Dirt’ was very amusing, with which she falls in love through gardening, comparing it to Mr Right with a subtle rhyme throughout. In ‘Oxytocin’, included in the new ABR anthology, the line ‘last night I strode among the stars’ is repeated at intervals creating a profound effect and in ‘Seeds’ we hear the story of Demeter and Persephone, where the latter is a ‘creature of light, the sun and beaches’. Kate then read ‘Older men’, a poem she wrote years ago before, in her own words, she got old, where he is ‘courteous with your mother whom he could have married’, another humorous poem ending with the line ‘consider this a shopping list’. To compliment this, Kate finished with a poem by David Campbell, her influence, called ‘Younger women’ with their ‘blue stare of cool surprise’. Thom I’ve heard before at Lee Marvin, and again was moved by the pieces he shared. After Peter spoke of Thom’s good use of colons to separate snatches of thought or dreams, he opened with a poem called ‘Homosuburbius’ and its repetitive line of ‘you’re dreaming still’, with ‘post boxes gagging junk mail’ and where ‘late night programming is flickering under their eyelids’. Thom’s next three poems were pastoral ones about his hometown in the hills presenting us with different aspects of it. In ‘Threshold’ there is ‘a fine grain of stars’ and in ‘Freehold’ there are ‘a pair of eagles riding the thermals’. The poet A R Ammons was one of Thom’s influences so he read one of his poems called ‘The city limits’ followed by a two-part one of his own called ‘Carte blanche’, where there is ‘death with a moon in her pocket’ to prove a poem can be serious without being solemn. Thom finished with his poem ‘Nothing doing’ from Australian Love Poems 2013 published by Inkerman & Blunt, where we find that ‘a bowerbird is hoarding memories’. It was an amazing session (both the first and only one I will unfortunately have time to attend at this year’s Writers’ Week) with some damn fine poems, plenty to absorb and ponder.